WATERLOO – Two Wilfrid Laurier University students and executive members of Laurier’s Centre for Women in Science (WinS) will be attending an event to celebrate the first International Day of Women and Girls in Science at the United Nations (UN) Headquarters in New York City on Feb. 11. This historic occasion is part of an ongoing global effort to achieve gender equality in science and to recognize the critical role women and girls play in science and technology. Caroline Alpert, a fourth-year Kinesiology student and communications coordinator at WinS, and Eden Hennessey, a doctoral candidate in Social Psychology and manager of the student executive team at WinS, will both be attending the event at the UN Headquarters. Hennessey studies the experience of female scientists and is the creator of the #DistractinglySexist: Confronting Sexism in Canada’s Tech Triangle photography exhibit held last September at the Laurier Library. She is looking forward to meeting fellow researchers, policy makers and advocates to discuss her research. WinS will celebrate the occasion with special commemorative posters. The centre invites the Laurier community to print or share the posters on social media and show their support of women in science with the hashtags #WinS, #ParityinScience and #DayofWomeninScience. 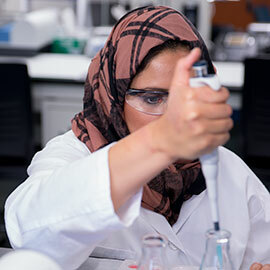 Laurier’s Centre for Women in Science (WinS) promotes the participation of women in STEM (Science, Technology, Engineering and Math). The centre seeks to strengthen science and technology research in Canada, support and celebrate women’s contributions to the sciences and mathematical social sciences and address challenges women still face in higher education and careers in science. Membership is open to all at Laurier and partner institutions who are interested in participating in research and/or activities that promote women in the sciences and mathematical social sciences. For more information go to wlu.ca/wins.